A man from Addison, New York, was arrested after he made a menacing phone call to Rep. Ilhan Omar's office, speaking with staff. The FBi says that the man told the staffer, "Do you work for the Muslim Brotherhood? Why are you working for her, she's a f*cking terrorist. I'll put a bullet in her f*cking skull." So reports The Guardian's Ed Pilkington. The suspect said he is "a patriot" and "loves the president," and that he "hates radical Muslims in our government." He owns a shotgun and a .22 caliber handgun, both of which police found at his house. She was also hazed by House minority leader Kevin McCarthy. McCarthy ironically charged that Michael Bloomberg, George Soros and Tom Steyer, prominent wealthy Jewish-Americans, were trying to "buy" the election. 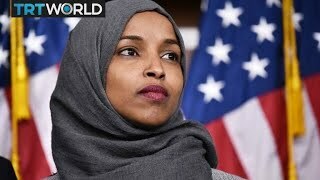 Nancy Pelosi's willingness to put Ilhan in a negative spotlight and to basically brand her a bigot, when there is zero evidence of Omar (who has Jewish constituents of whom she has spoken fondly) being prejudiced. Trump this weekend, addressing wealthy Jewish Republicans, referred to Israeli Prime minister Netanyahu as "your prime minister." Although observers like Alexandria Ocasio-Cortez blamed Trump and Fox Cable News for the atmosphere of hatred for Muslims that whipped up the suspect's rage, his specific allegation that Ilhan Omar is a member of the "Muslim Brotherhood" actually was made by Adam Milstein, a board member and major fundraiser for the American Israel Public Affairs Committee (AIPAC) and a secret funder (despite his denials) of the McCarthyite "Canary Mission" site. Milstein, a convicted tax cheat, brands college professors and undergraduates as "anti-Semites" and "unpatriotic" if they oppose the Israeli policy of annexing the Palestinian West Bank, subjecting Gaza to a civilian siege, and keeping the Palestinians stateless and without basic human rights. Most disturbingly, he is attempting to ruin the lives and careers of our children for taking a principled stand.